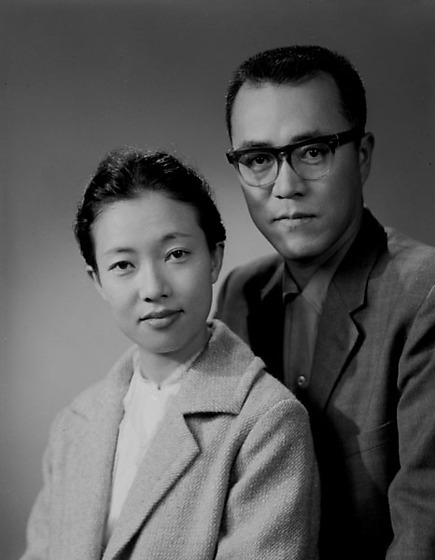 Studio half-portrait of a couple, Mr. and Mrs. Ono, Los Angeles, California, 1963. Turned slightly to the left, man in suit jacket, eyeglasses and crew cut stands behind a woman in light-colored coat. Both look directly at the viewer. 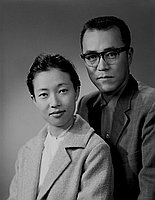 Typed on original negative envelope: Ono, Mr. & Mrs. -- 1963 -- Artist -- Wakayam Ken.